Physician empathy is an essential attribute of the patient–physician relationship and is associated with better outcomes, greater patient safety and fewer malpractice claims. We tested whether an innovative empathy training protocol grounded in neuroscience could improve physician empathy as rated by patients. We randomly assigned residents and fellows from surgery, medicine, anesthesiology, psychiatry, ophthalmology, and orthopedics (N = 99, 52% female, mean age 30.6 ± 3.6) to receive standard post-graduate medical education or education augmented with three 60-minute empathy training modules. Patient ratings of physician empathy were assessed within one-month pre-training and between 1–2 months post-training with the use of the Consultation and Relational Empathy (CARE) measure. Each physician was rated by multiple patients (pre-mean = 4.6 ± 3.1; post-mean 4.9 ± 2.5), who were blinded to physician randomization. The primary outcome was change score on the patient-rated CARE. 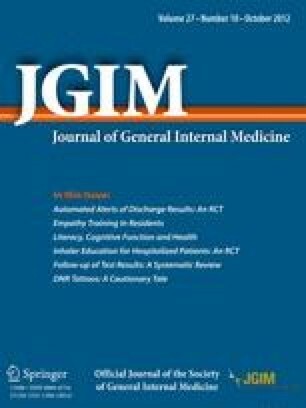 The empathy training group showed greater changes in patient-rated CARE scores than the control (difference 2.2; P = 0.04). Trained physicians also showed greater changes in knowledge of the neurobiology of empathy (difference 1.8; P < 0.001) and in ability to decode facial expressions of emotion (difference 1.9; P < 0.001). A brief intervention grounded in the neurobiology of empathy significantly improved physician empathy as rated by patients, suggesting that the quality of care in medicine could be improved by integrating the neuroscience of empathy into medical education. Contributors: We thank Dr. Lidia Schapira for her helpful comments on the manuscript and Dr. Brian C. George for his assistance with study design and recruitment. We are grateful to Paul Ekman, PhD for permission to use the Ekman Test. We are also grateful to the residents and fellows who participated in this study, to the patients who provided ratings of physician empathy, and to the staff, program directors, and department chiefs of the participating specialties. We are grateful to the following foundations for their generous support: The Arnold P. Gold Foundation, The David Judah Fund, The Josiah Macy, Jr. Foundation, and The Risk Management Foundation. The funding agencies played no role in the design and conduct of this study, including analysis and interpretation of data, and preparation, review, and approval of the manuscript. This work has not been presented previously. Helen Riess reports her role as Chief Technology Officer for Empathetics, LLC. This study was completed prior to formation of Empathetics, LLC. The other authors declare that they do not have a conflict of interest.